The hostel at Cherbourg was wonderful. To start with, the building itself is interesting, it belonged to the French Navy, the staff were friendly and helpful, they let me park the motorbike right at the door, breakfast was included in the price and I got a four-bed dorm all to myself, so I had space to hang all my gear to dry (which took the whole room). After a good night’s sleep and a hearty breakfast, I was ready to go and visit everything I had to skip yesterday. It was a glorious day, nice, warm, not a cloud in sight, perfect for riding. 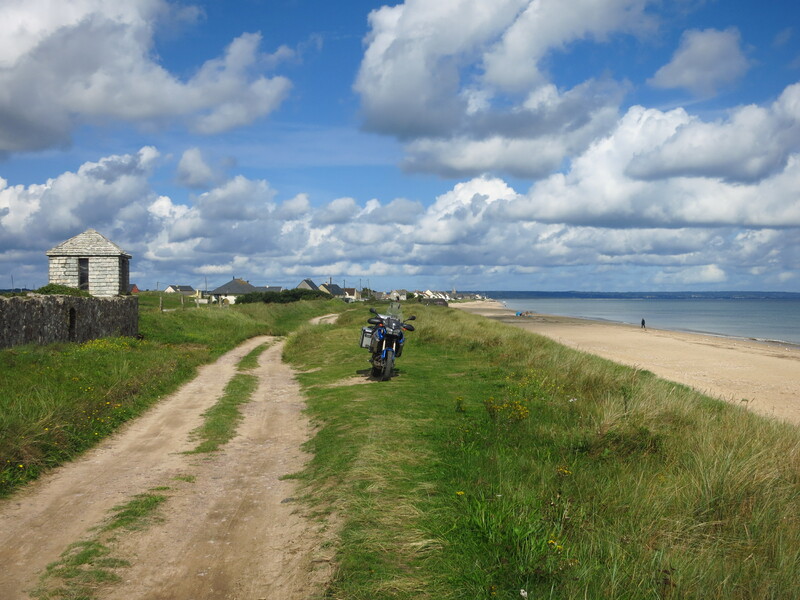 My plan was to see the beaches again and reach Caen by early afternoon in time to visit the big war museum there, but it was not to be. To start with, I was more tired than I realised, and I had not heard the alarm clock, so the intended 7am departure had turned into a 10am one. On top of that, in such good weather, I was going to get easily distracted constantly by dozens of interesting things. 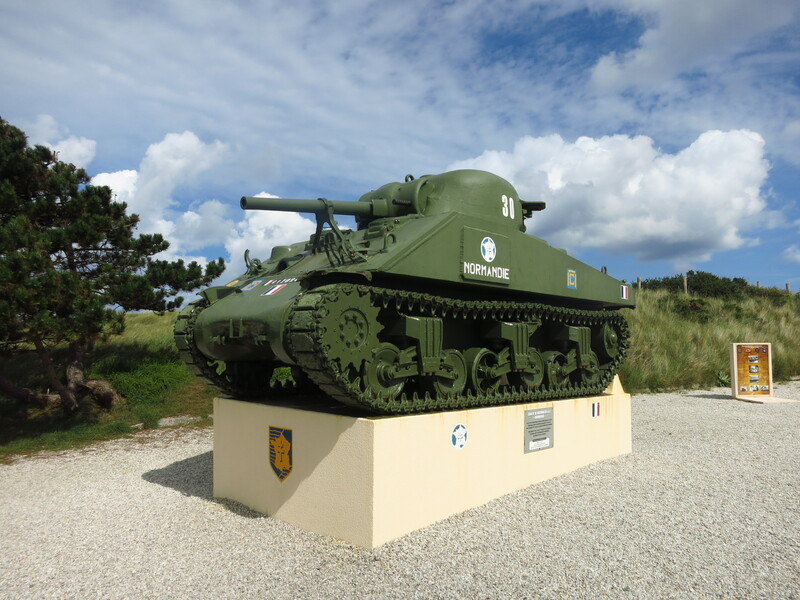 I headed to Ravenoville, where I wanted to turn left, take the small road that runs right next to the sea and ride along Utah beach to the memorial and the museum, but just past Fontenay-sur-Mer I saw a sign indicating ‘Crisbecq Battery’, so I had to turn off and see what it was. 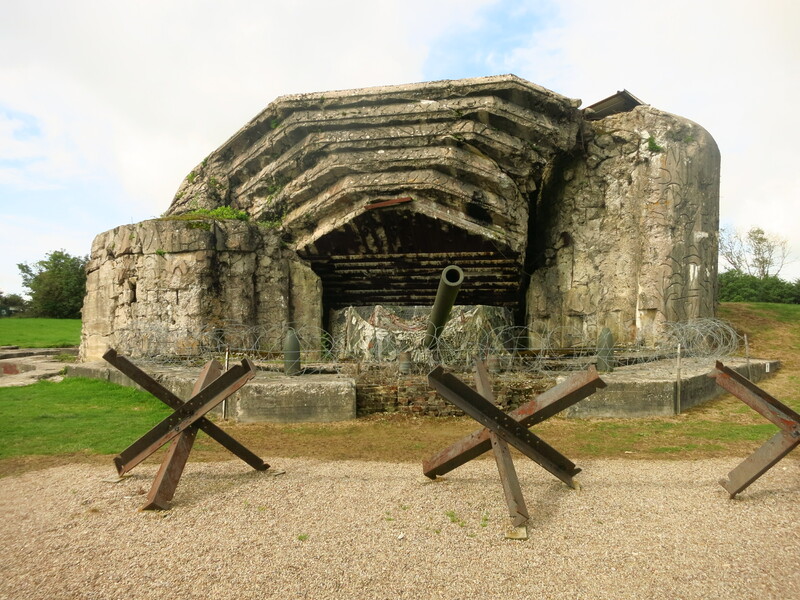 It was one of the many batteries that formed the Atlantic Wall, with three canons, two of them in casemates, that could fire at a distance of about 30 km, covering the beach between Pointe du Hoc and Saint-Vaast-la-Hougue. One of the casemates is partially destroyed, but the other one, as well as a network of trenches, have been preserved and are now part of a museum. This position fired upon Utah beach during the landings, and was not taken until 8 days later. Instead of going back to the main road, I followed this one and it lead me straight to the beach, where I found the road that led directly to the museum, 12 km of gorgeous road right along the sea. On the way there I found several other ‘distractions’ – first, the predecessor of the Atlantic Wall, an old 17th century fort build as part of a 25-kilometre long line of defence against English attacks on the coast that consisted of 15 forts. 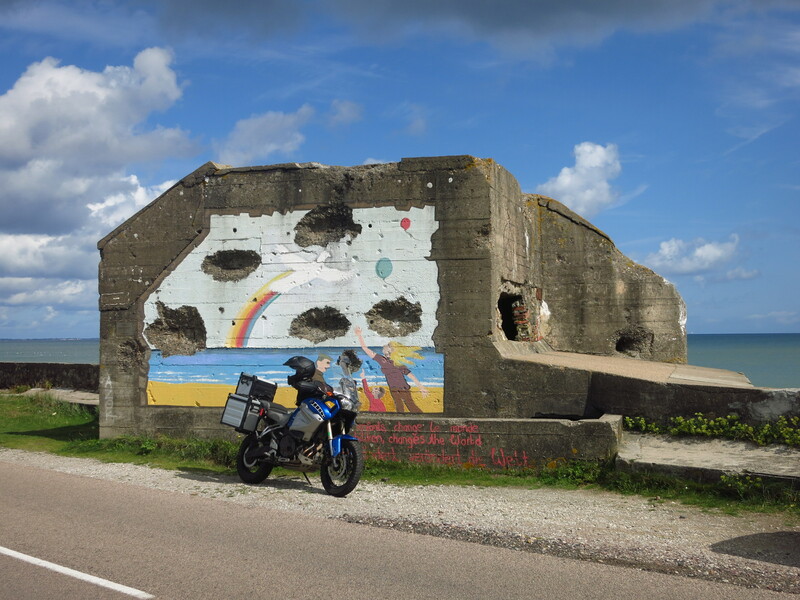 Then, more remains of the German Atlantic Wall, several bunkers in different states of conservation along the beach, and finally, a memorial with a Sherman tank, but this one was special. The US 4th Infantry Division landed here, 2,5km south of their intended position, a navigation mistake that saved a lot of lives. The fortifications at this point had been effectively destroyed by accurate RAF bombings, leaving this area outside the firing range of Crisbecq and Azeville batteries. The beach was taken in an hour and the engineers cleared paths to land more troops. Among them, General Leclerc’s 2e Division blindée. 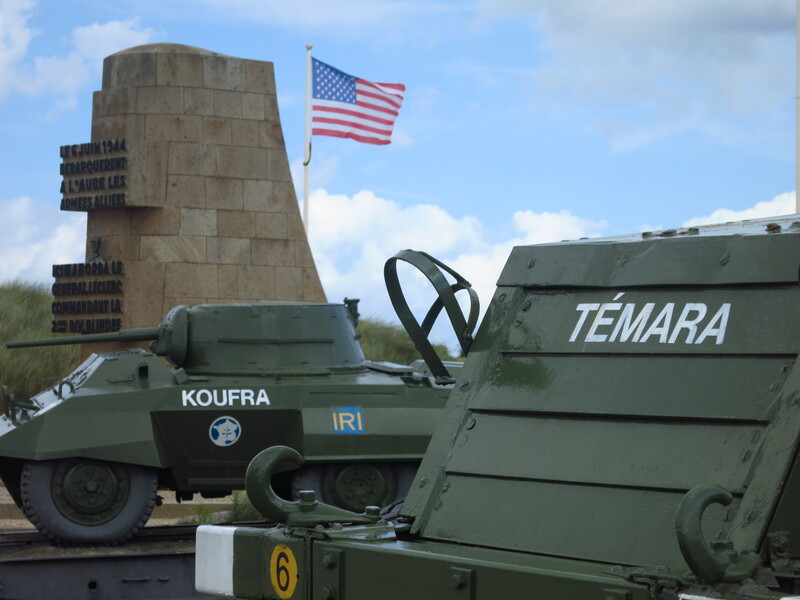 Belonging to the Free French army, this division had been successfully fighting against axis forces in Libya, and after sailing back to the UK they were attached to the US army and sent to Utah beach, making them the first French forces to start fighting inland to retake their country. They would then go on to liberate Paris. During all these visits, a slight feeling of shame had been lurking at the back of my mind. In WWII soldiers from the UK, the USA, Canada, France, Poland, Australia, Belgium, New Zealand, The Netherlands, Norway, Czechoslovakia and Greece fought here to turn the war around, and what was the army in my country doing? Supporting a fascist dictatorship that was friendly to the Nazis and would last 40 years. Not only that, they were so vile, gutless, cowardly and opportunistic, that the moment things started to look grim for the Germans, Franco quickly ran to get chummy with the Americans. At least I found some consolation here, when I discovered that between 300 and 350 Spanish Republican soldiers had been part of Leclerc’s 2e Division. 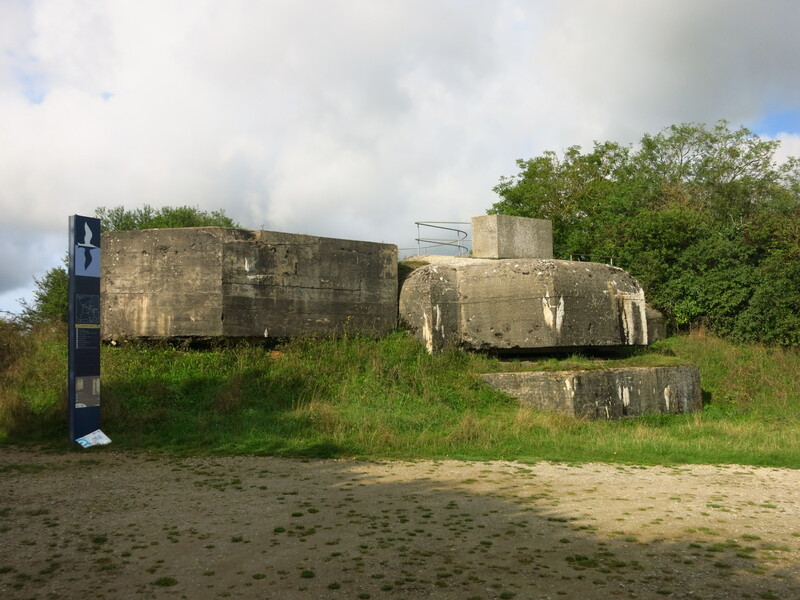 The Musée du Débarquement in Utah beach is located next to a German fortification that, once taken, was used as headquarters for the 1st Engineer Special Brigade, from which all landing operations from then on were directed. Thanks to their work, all the troops, weapons, vehicles, munitions, fuel, and a long list of supplies needed to take Europe landed on these beaches. 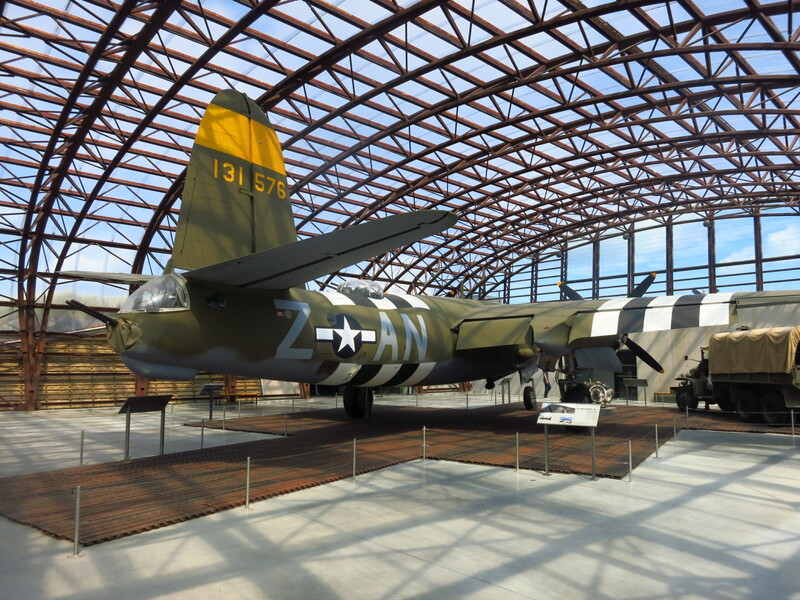 The museum offers a very good explanation of the landings on D-day and has a very interesting collection of vehicles, including an amphibious truck, a landing craft and a B26 bomber. After visiting the museum I headed to Sainte-Mère-Église to visit the Airborne Museum, with a short stop at Sainte-Marie-du-Mont on the way there. 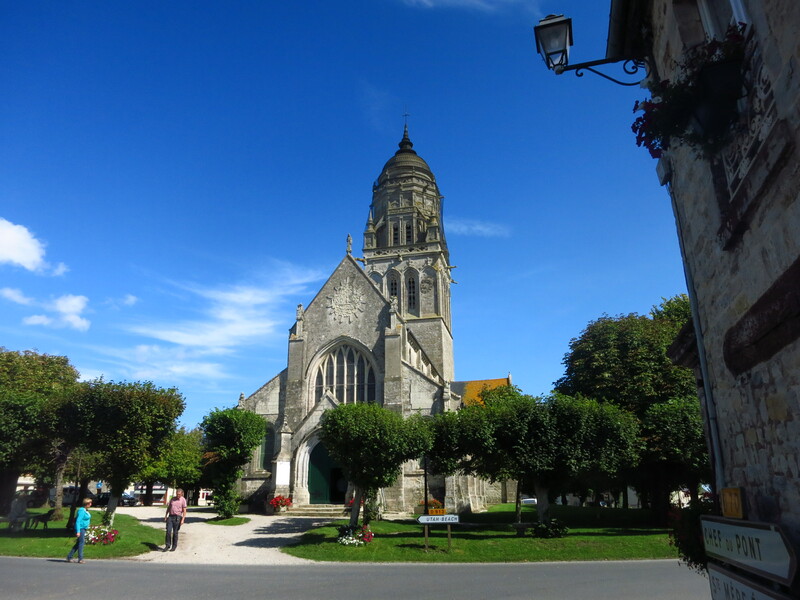 The surroundings of this village were the scene of the famous Brécourt Manor Assault on D-day. A statue of Richard Winters, commander of the Easy Company can be seen here. I went on to the museum to find out more about him and his troops. 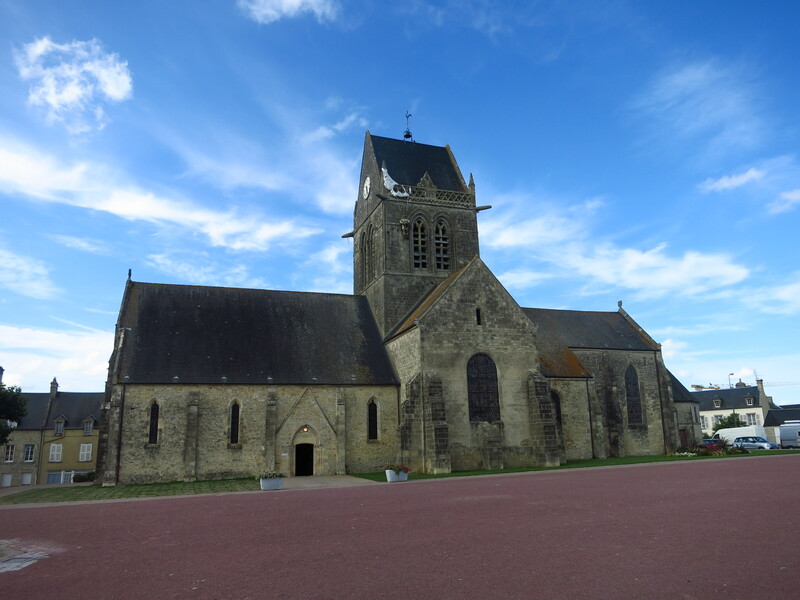 Sainte-Mère-Église holds the honour of being the very first town in France liberated on D-day. Here is where it all started. The museum is right in the town centre, opposite the church, and the first thing you notice when you arrive, is that there is a paratrooper hanging from the church spire. It is a memorial to John Steele, a member of the 82nd Division whose parachute was caught in one of the pinnacles of the church. He was wounded and unable to escape from the position he found himself in, hanging by the side of the church tower, witness to the fighting below him. He played dead for two hours until the Germans finally lowered him and took him prisoner. He later escaped and joined his division to continue fighting. Most people refer to the D-day landings as Operation Overlord, but that is technically wrong. That name refers to the whole operation to invade Normandy, which took much longer than just the landings on the 6th of June. The actual name for the landings was Operation Neptune and the 82nd and 101st Airborne Divisions represented the opening manoeuvre of that operation. These men were to be dropped behind enemy lines defending the beaches, and their mission was to secure exits off the beaches for the landing troops, block the approach to the beaches to prevent a German counter-attack and establish crossings over the Douve river so that American troops landing at Utah and Omaha beach could be joined. The drops were scattered over a large area due to a number of adverse factors that affected navigation of the C-47 airplanes carrying the troops, and lots of soldiers found themselves alone or separated from their units. Anticipating such a move, the Germans had flooded large areas behind Utah beach, leaving only five corridors to access the beach. Laden with between 40 and 50kg of equipment and tangled in their own parachutes, some paratroopers drowned. All this meant that they took three days to secure approaches to the beach, but they successfully managed to repel German counter-attacks and take their strong points. Their mission helped the troops at Utah beach to break through the Atlantic Wall for the first time. Among these men, Easy Company, led by Captain Richard Winters after their commander had been killed on a C-47 before he could even jump off. Once he found his men and they joined their parent company, they were ordered to deal with some German guns nearby, at Brécour Manor. Without any further details about the mission, he and his troops went there to find four 105mm guns firing over the allied troops trying to get off Utah beach. Despite being outnumbered they managed to take the German position and destroy all four guns, saving hundreds of lives and becoming a textbook example of small-unit tactics that is still taught today at major military academies. It was already late afternoon and I was still in the Utah beach area… There was no way I could reach Caen, so I decided I would end the day at Arromanches with a visit to the 360º cinema and then camp in the area – the weather was good and I had seen several campsites on the way west the day before. I arrived at the cinema at 6:45pm, and the last screening for the day was at 6:40. Defeated, I made my way down to the town and found a municipal campsite right next to the centre. It was cheap, nice and quiet, so I pitched the tent there. 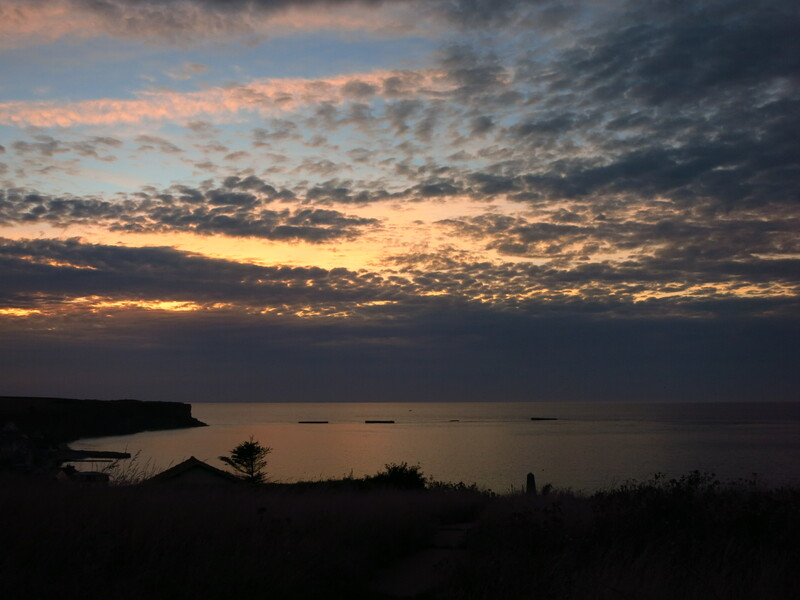 I still had some time to spare before sunset, so I rode up to the cinema again and sat on a lonely bench overlooking the village to see the sunset over the remains of the harbour. This entry was posted in Normandy 2015, Travel and tagged 101st Airborne Division, 4th Infantry Division, 82nd Airborne Division, Atlantic Wall, B-26, C-47, Cherbourg-Octeville, Crisbercq Battery, Easy Company, General LeClerc, John Steele, Normandy, Ravenoville, Richard Winters, Sainte-Maire-du-mont, Sainte-Mère-Église, Sherman tank, Utah Beach, WWII by Kilian. Bookmark the permalink.